This years seems to be quite a busy one on the Chanel beauty front with a lot of small collections being released through the year. Close on the heels of the Chanel Summer 2013 (L'ete Papillon de Chanel) Makeup Collection comes the Chanel Avant-Premiere collection. This makeup collection focuses on the lips and includes, along with a couple of new Rouge Coco lipsticks and 3 new nail polishes, the new, improved, extra-pigmented Rouge Coco Shines. There are about 8 new shades of the Rouge Coco Shines and 6 new Rouge Coco lipsticks. I did not buy everything in this collection, but here's a sneak peek of what I did pick up. It's a bit of a risk whenever I buy makeup without swatching or trying out the products, and I have a not-so-small pile of lipsticks that I don't reach for all that very often. This time, I did a bit of research before buying and some asking around (thank you, Sandhya! ), and I am quite happy with everything I picked up. 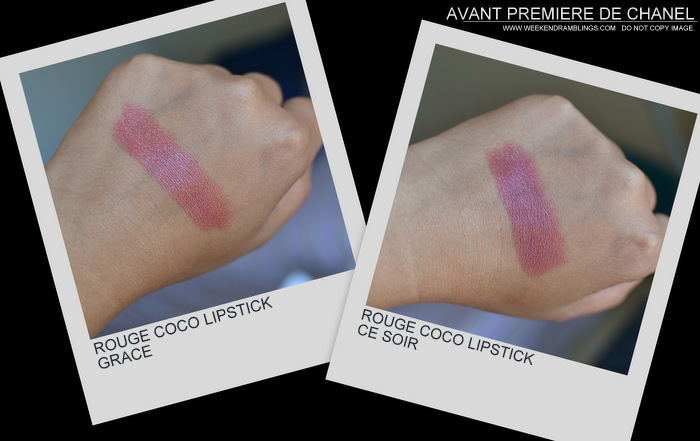 From what I have tried so far, the new Rouge Coco Shines are just amazing. Like Rouge Coco Pygmalion from the summer 2013 makeup collection, these too pack enough pigment to show up on my lips while retaining the glossy, hydrating feel of the old RCS. 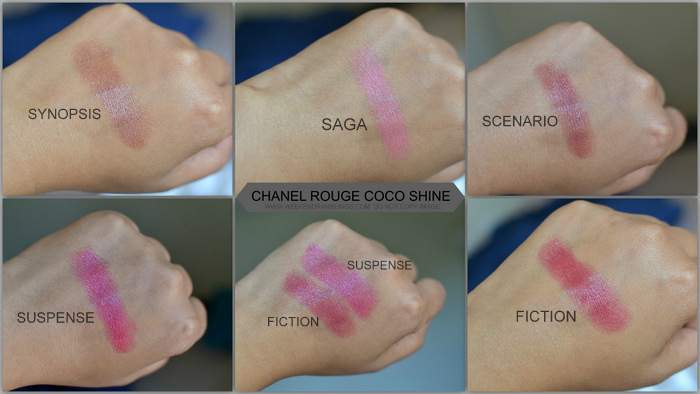 Some of these RCS do have shimmer in them, but as always, Chanel does shimmer like nobody else can! It just adds to the glossiness and shine without ever showing up as chunky shimmer. I do want to get the other lipsticks from this collection - the lighter pinks and corals - but I will have to wait a bit until the collection launches in stores here in the US (should be any time now, I think).